Integrated skin text editor for Jalbum! During the Christmas holiday I've been having some great code flow with Jalbum. I got hold of a great free Java component I could build an integrated skin text editor around. The author of this component (Robert Futrell) has been extremely helpful and tweaking his component to our needs. Code completion that looks up all Jalbum variables together with help text. No need to refer to http://jalbum.net/developer/skins/variables all the time for skin developers! This should simplify skin development significantly. The text editor (400K size) is implemented as a "Jalbum Plugin" using a new Plugin architecture that allows any Java developer to add new extensions to Jalbum. Plugins can be added to the Jalbum Tools menu and to the context menu of the Jalbum Explorer window. It is located inside "ext/JTextPad.jar" for those who wish to remove it or run it as a stand-alone app. When the final tweaks and bug fixes have been done (like removing debug info) I'll compile installers for all operating systems. Re: Integrated skin text editor for Jalbum! Something on my side of the fence? Did I say very very nice! It should work the same for .bsh files. Doesn't it? 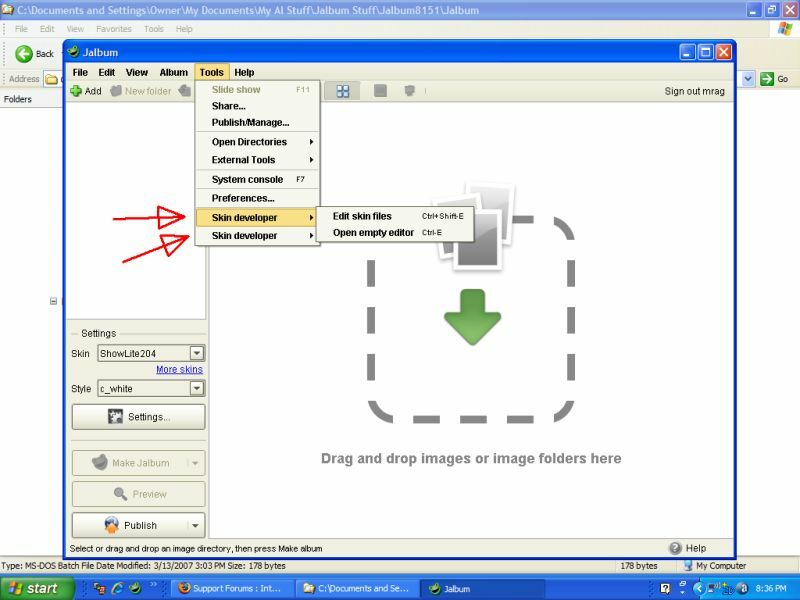 I made a default to open "index.htt" and "slide.htt" but you can easily open more files within the editor. I can't reproduce that mess with slide.htt. Does it happen with a specific skin? I tried out several skins last night, but all looked the same. This morning I tried again, but I guess I must have been sleepy last night. 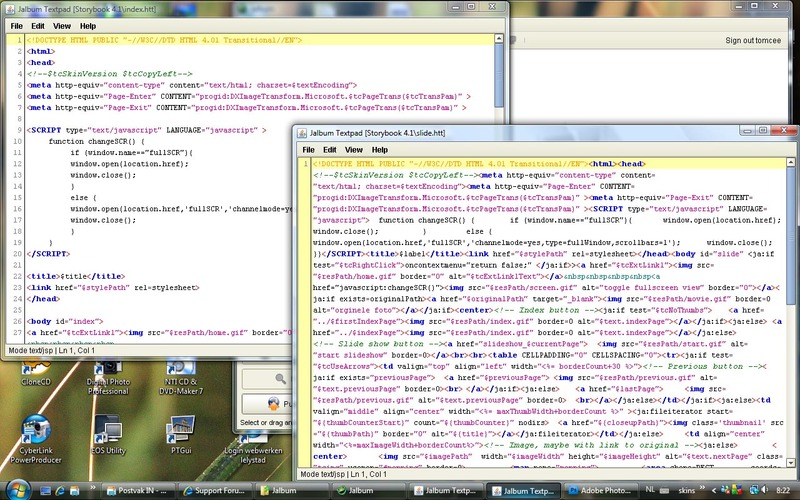 This is what happens: whatever skin I choose, the texteditor allways opens the files for the default skin. But I'm running it on the starjalbum.bat, not installed over the 8.1.5 edition. It should make no difference though. See attached screenshot for how the windows look. ...whatever skin I choose, the texteditor allways opens the files for the default skin. Regarding that very long line in the StoryBook skin. Does it only happen to Storybook or other skins too? I should add that you need to use the version of Jalbum that requires Java. The compiled version isn't updated yet and will always need a full recompilation. There's something unusual about the line feeds/carriage returns in the Storybook slide.htt. Notepad doesn't like it, either - it all shows up as a single line. Notetab Light, on the other hand, has no issues with it. Ok, tested with the new jar: all skins opens, so that's solved. Still had the problem with the messed up storybook slide.htt. I normally use jEdit as editor, but it can be possible that I modified some text in the NetBeans editor but can't remember. I've solved it: I opened the file in jEdit, copied all to Notepad where it did look good formatted!, can this be system dependend?? ), selected all again and copied the text back to jEdit and saved it, now it opens fine formatted. So, all and so far, everything is okidoki. Going to play some more with the text editor this evening. David, are you planning on making the java files for the texteditor available? And telling us how we can put our own applications to expand jalbum. I have to say this again, I'm very pleased with the texteditor, and very enthousiastic about the concept of expanding jalbum with other applications. That's really cool! It loads very quickly and has keyboard shortcuts like Ctrl-Home/End. I used the zip version (reads 8.1.6) like Tom. Is it just me that is seeing the "Skin Developer" entry TWICE? Is it just me that is seeing the "Skin Developer" entry TWICE? David, are you planning on making the java files for the texteditor available? And telling us how we can put our own applications to expand jalbum. I have to say this again, I'm very pleased with the texteditor, and very enthousiastic about the concept of expanding jalbum with other applications. Yes, I aim to release the source for JTextPad and also update our API section (http://jalbum.net/api) so you can see how you make your own plugins to Jalbum. Stay tuned! When the update is done, you only need to peek at the JAlbumPlugin and JAlbumContext classes. If you make improvements to JTextPad, please pass them on! I'd like to see a "Create a skin" template. Make sure your "ext" folder don't contain multiple versions of the JTextPad app, like "jtextpad.jar" and "JTextPad.jar".